The PLM modular media filter system for aboveground pools provides convenience and virtually maintenance-free operation. System features Sta-Rite's modular media technology whose systems can handle dirt loads of up to 15 times more than sand filters of equivalent size. Posi-Lok ring closure is safe and easy to use. Ring is equipped with Posi-Lok safety latches to ensure ring is properly installed and to prevent little hands from gaining access. 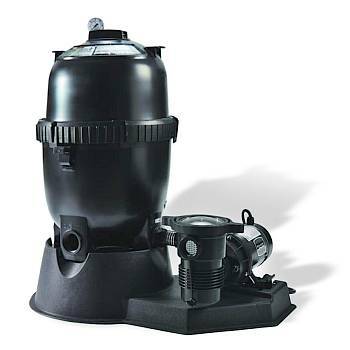 The filter is conveniently paired with the quiet running JW series pump with large capacity, 5 in. strainer. Click Here for a PLM Filter System Manual. Durable two-piece tank housing constructed of rugged ABS thermoplastic to ensure a long-lasting tank life. Complete media coverage combined with shallow pleats means greater dirt holding capabilities, resulting in longer filter cycles and less cleaning. 150 sq.ft. above ground cartridge filter. 6 ft. standard plug cord. Hose Kit (Two 6' x 1.5" lengths of hose, hose adapters and stainless steel hose clamps). 10 year tank and Posi-Lok ring warranty. 2 in. ports optimize plumbing hydraulics.